This Blog is for me to show off my stuff. The stuff I make and the stuff I get. Also for my ramblings. As a new year is about to start, I thought I would start to try this blogging thing again. It has been a while. This last year has been an interesting one. Right now our furnace is out. Only one room has heat. The rest of the house has dropped down into the 40's. Thank goodness for space heaters. We are currently camping out in our family room, waiting to find the right part to fix our heater. Our family tried our hand with foster care. What a road that was to travel. But the impact it was having on our kids was to negative to continue. Our son was diagnosed with ADHD and high functioning Autism. So that has been another interesting road to travel. We are learning how to help him succeed in his everyday life. Things are going well. He even does his homework without the breakdowns that we were dealing with. I am also homeschooling our oldest kid. It is a learning experience for both of us. 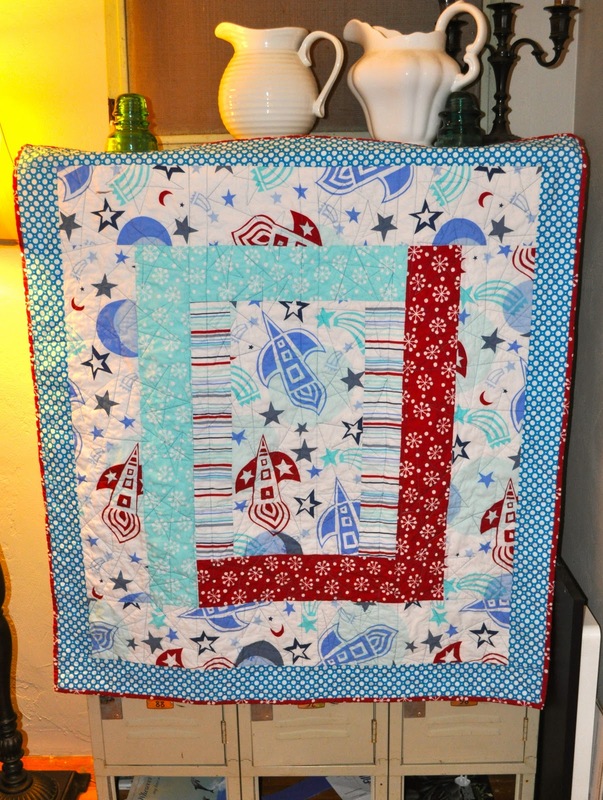 Sad to say, I haven't been able to do as much quilting as I would have liked. My creativity has just not been there. I am wanting to start new and really be able to dig into my brain and have some fun creating some beautiful happy quilts. First off I am in no way associated with Rockwell tools nor do I have any great giveaway. I am just a girl who was tired of using her husbands big heavy hard to manage corded drill. So I played with a few at Lowes and really liked this one. There is a lot of torque in this little thing. You don't have to fight with the rounded thing on the front to switch bits, it uses bits with a hexagon bottom that chuck into the drill, or 3rill as its called. Screwdriver, drill and impact driver thing. Oh and it has this clutch thing that stops you from rounding out your screw heads. Something I am famous for with my hubby's drill. So this little beauty came home with me. I just hung a shelf on my sewing room wall and put together a slatted wood sign thing. (I am very into technical terms) I am smitten. There I said it, and I feel better now. 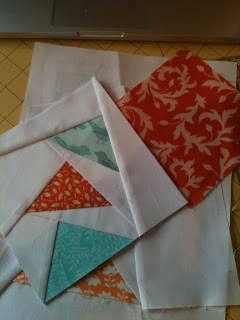 I am working on a bee block for my "To Bee Orange and Aqua" group. There is no doubt that the block is beautiful and the finished quilt will be gorgeous, but I really do not love doing the paper piecing. I am not a precise quilter. I just do what I want with no real rules. Paper piecing is full of rules and having to do things in a very precise manor. I do think my head may burst from all the thinking that I am having to do. This is not to say I will not paper piece. I do have 2 quilts in mind that I would love to make that are pieced in this way, but I really have to get myself jazzed up in order to start them. One day I will, but for now I just need to get through this block and get the dear thing in the mail back to the quilt maker. I think I'm allergic to winter. This is a sad thing because I love winter. A gloomy cloudy day is so happy to me. I love rain and a little bit of snow. Ice I'm not to fond of. But back to being allergic, I have had nothing but migraines and sinus pressure since the cold more winter like weather has rushed in. It makes it very hard to enjoy when it feels like my head my explode right off my neck. Not a pretty picture. I can't help but be a bit on the grumpy side. I am working on a bag for a high school friend that said she wanted one. Granted today I haven't even made it into the sewing room. I have been folding and putting away the mountain of laundry that has piled up. I hate doing laundry. Its not so much the washing but the putting it away. But the bag is cute. Just a tote with a patchwork pocket in mostly greens. I am also doing the swoon-along http://www.flickr.com/groups/1904864@N22/ I have no idea how many people the group is up to. It will be fun seeing how different one quilt will look in different fabrics. I still haven't picked out what I want to do mine in. I did do a test block in pink and grey. I think it will turn into a baby quilt for my friend. I thought I had till April for that wee baby quilt, but surprise, she had that sweet little baby girl 3 months early. Baby Olive is doing really really good for coming into the world at 26 weeks. Beautiful tiny little 2 lbs 7 oz (I think) baby. No shop stuff this week. the house needs to much attention this week and my focus is off. Hope to back at creating fun stuff next week. Maddie has been working on a quilt for her teacher and his wife who are expecting their first baby next month. She did the layout and the sewing herself. I helped with the cutting and some of the quilting. She rocked it too. This quilt turned out great! Well this week did not go as planed. Sick, sick, sick around here. Not me but the kids, one right after another. Started with Lucas over the weekend and the first 2 days of the week. It his Wyatt on Tuesday and I just sent him back to school today. And Abbie started last night.I don't think I have slept all week. The Hubby person drives trucks and is gone 5 days at a time, so this has been all me. Then yesterday I slipped and fell on some big rocks in my front yard and binged myself up. But I did get a few things done. 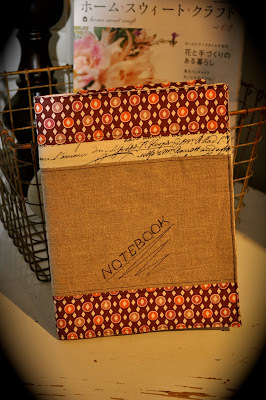 I made that notebook cover and listed that little bag. 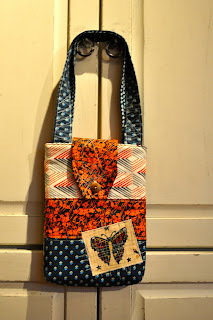 I made the bag before Christmas but hadn't gotten around to listing it on etsy till this week. Next up is helping Madelyn finish up the quilt she is making for her teacher's soon to be born baby boy. She had done a great job on the quilt. As for my goals for this month, I will only get 2 things listed in my shop, my friend was having her baby in April had the baby yesterday, 3 months early. Baby is doing great and mama is also. So one of my goals for this month was list 3 new items in my etsy shop every week. So its Saturday and I added 3 new items. Yay for me. They are little things and didn't take to much time getting them together. So in other news, Maddie started making a quilt for her teacher and his wife that are having their first baby next month. She is using the super cute rocket ship fabric from Prints Charming. And because she is doing this little project my very thoughtful Wyatt insisted that I make a quilt for the teacher he had last year who is also expecting a baby soon. So I dug out the super cute charm pack of Sherbet Pips by http://comfortstitching.typepad.co.uk/comfortstitching/ super cute fabric. Now that I started I want one for me. I may have to hunt down more of that fabric. I need to et this one quilted and wrapped up for him to take to her. He was so excited to come home from school and see that I had started it. get some things made and added to my sad little etsy shop, the goal is 3 items a week finished and listed. Can be small and simple. write my first tutorial for a fun little netbook holder I made before Christmas. This is a Flickr badge showing public photos and videos from maddieandme1. Make your own badge here. I am a stay at home mom. I love spending time with my kids. I love fabric. The way it looks, the way it feels. It is a wonderful thing. I have stacks all over my sewing room and it finds it's way into other rooms.Fun,Fun,Fun. I love to quilt and make bags.